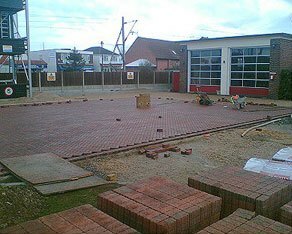 Frinton Fire Station under construction. Materials used were Marshall's 80mm Priora Permeable blocks in parking bays and 60mm Keyblok in all other bays. These blocks are open graded and allow storage of surface water within the pavement construction.